An outdoor concert in Oklahoma featuring 90’s boy band favorites Backstreet Boys and 98 Degrees was cancelled on Saturday after an intense storm struck the area and injured at least 14 people, venue officials said. “We never want to put our fans in harm’s way and with tonight’s weather and the injuries from earlier, we have decided to cancel the show and will attempt to reschedule,” the Backstreet Boys said on the band’s Twitter page. Patrons at the sold-out show held at the WinStar World Casino and Resort in Thackerville, nearly 130 miles south of Oklahoma City, were asked to seek shelter at around 5:00 p.m. local time when lightning appeared within four miles of the casino, the resort said in a statement. About 150 people ignored the warnings and continued to wait in line for the show. “At approximately 5:30 p.m., the storm hit and knocked over the concert entrance trusses with 70-80 mile an hour winds and heavy rain,” resort officials said in a statement. Fourteen people were treated at the scene and taken to local hospitals. Two have been released, officials said. The Backstreet Boys, best known for hits like “I Want It That Way” and “Everybody (Backstreet’s Back),” and 98 Degrees, famous for their love ballad “I Do (Cherish You), were scheduled to perform for more than 12,000 fans. 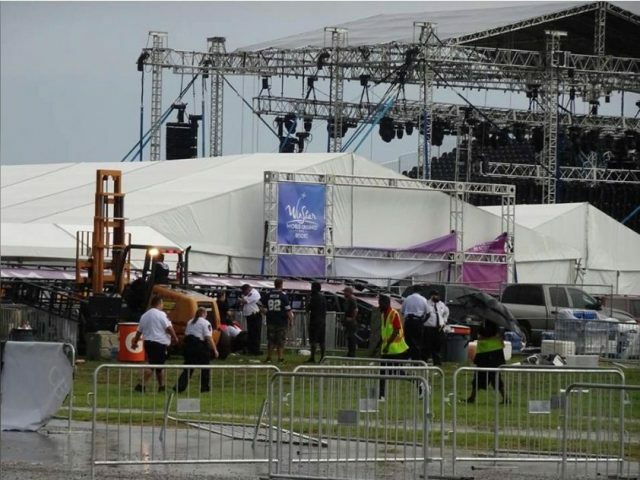 Backstreet Boys member Kevin Richardson told fans via his Twitter account that safety inspectors had checked the stage for damage after the storm. Organizers said the concert would be rescheduled and tickets to Saturday’s show would be honored on the new date.